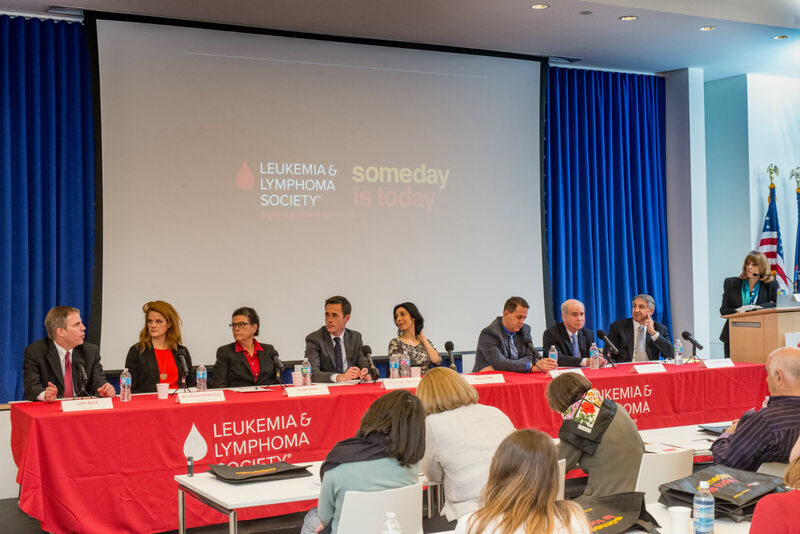 The Leukemia & Lymphoma Society recently brought together a world-renowned panel of thought leaders to discuss the latest advances and insights into blood cancer research and treatment, drug costs and patient access, and patient advocacy and policy. “There’s never a good time to get cancer but this is a phenomenal time to be fighting it,” said Louis J. DeGennaro, president and CEO of The Leukemia & Lymphoma Society (LLS). Patients and families dealing with blood cancer are benefitting from investment in the human genome project that aims to map all human genes, as well as new technologies and treatment modalities. The pharmaceutical industry has stepped up with more than 900 cancer drugs in development (almost 300 for blood cancer). Patient-focused groups have had an “epiphany” about the importance of best practices and now recognize the key role they play in supporting new therapies, he said. Increasing collaboration. Collaboration must continue between scientists, academics, pharmaceutical companies, regulators and advocacy groups. The U.S. Food & Drug Administration (FDA) has become more proactive and is actively working with pharmaceutical companies to ensure rapid reviews of new therapies. For example, seven new treatments were approved for myeloma in the past year – compared with 16 in the past 12 years. Collateral damage. Research needs to focus more on the “collateral damage” that can accompany harsh treatment. Patients know how they were before and are very aware of the high price they had to pay to survive (side effects or lasting effects such as chemo brain or neuropathy). According to Dr. Susan Love of the Dr. Susan Love Research Foundation, we also need true patient-reported outcomes that come directly from patients and not through doctors and researchers to improve quality of life. Access to treatments. The average cost of treatment for a leukemia patient is $120,000 a year, while the average U.S. median household income is $51,000, according to policy expert Dr. Rena Conti. People are facing trade-offs every day between treatments and other daily expenses. Policy solutions are needed that families, legislators, insurers and drug companies can all get behind so people can take advantage of medical breakthroughs, Conti said. LLS is funding a financial toxicity study to find out how and what proportion of patients are having trouble paying for treatments, what treatments are offered or not offered, what assistance is available, and the consequences of not having needed financial resources. Venture philanthropy. The system for bringing a new medication from bench to bedside is improving. It used to be that researchers would locate and validate a target and then go looking for a biotech or pharmaceutical company with a compound already in development, said Dr. Ken Anderson. Now, with venture philanthropy models such as LLS’s Therapy Acceleration Program (TAP), prototype medications can be pursued and accelerated when nonprofit organizations collaborate with biotech companies and academic researchers. Precision medicine and AML. Acute myeloid leukemia (AML) is the perfect disease to test the precision medicine concept, which tailors treatments to individual patients, said Dr. Ross Levine. Rather than being one disease, AML actually has 20 different subtypes – all of which have been treated with the same drugs for decades. We need to be able to recognize accurately and quickly what subtype a patient has and identify the appropriate treatment. With desperately ill patients waiting for new developments, we may also need to, on occasion, throw out the concept of needing Phase III study and use a selective trial in a small group. Targeted drugs. Dr. John Byrd, who played a key role in the development of rituximab and ibrutinib for the treatment of chronic lymphocytic leukemia (CLL), talked about a recent exciting study – the Resonate clinical trial – showing that ibrutinib as a first-line therapy can give patients a normal life span. Byrd said previously drug-resistant patients had dramatic responses to ibrutinib in the study. He said that combinations of targeted drugs may eliminate the need for chemotherapy. Promise of immunotherapy. Scientists have been discovering different approaches to harnessing the body’s own immune system to fight cancer. Checkpoint inhibitors, monoclonal antibodies, immunomodulatory drugs, vaccines and cellular therapies are just a few possibilities being explored. The immune system is potent and adaptable and may be able to “outsmart blood cancers.” Anderson said. The panel was moderated by Laura Landro, assistant managing editor and columnist, The Wall Street Journal.